In this article I would like to demonstrate how we can increase the number of logs in SQL Server for the engine. The SQL Server error log contains events and errors related to SQL Server engine and services. You can use this error log to troubleshoot problems related to SQL Server. The default value for the maximum number of log files is 6. However we can increase that. The maximum number of logs can be up to 99. 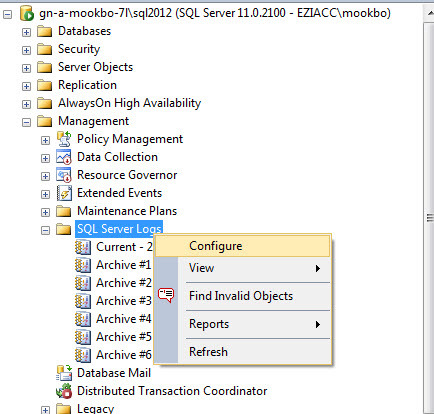 Step 5: When you click on configure the ‘Configure SQL Server Error Logs’ box opens. Change the Maximum number of error logs to the desired number. Step 6: Click on OK.
Good stuff bodhi !! Keep it up!